One of the things we love about Boulder City, is the diverse number of creative artists we have, and have had over the years, in our little town. Art feeds the soul and it has many forms, including the written word. (But we don’t see books on street corners!) We’d heard that the Boulder City Library has occasionally hosted events with local authors, and had met a few on our own around town. So we asked the Library for a list and found we had well over 20+ local authors in BC that they knew about! To highlight their efforts and get to know them and their process, and to learn what books they’d written, we decided to do a series of articles on our ‘Local Authors’. Today is the first of these and we’ll shoot to do approximately one per month! 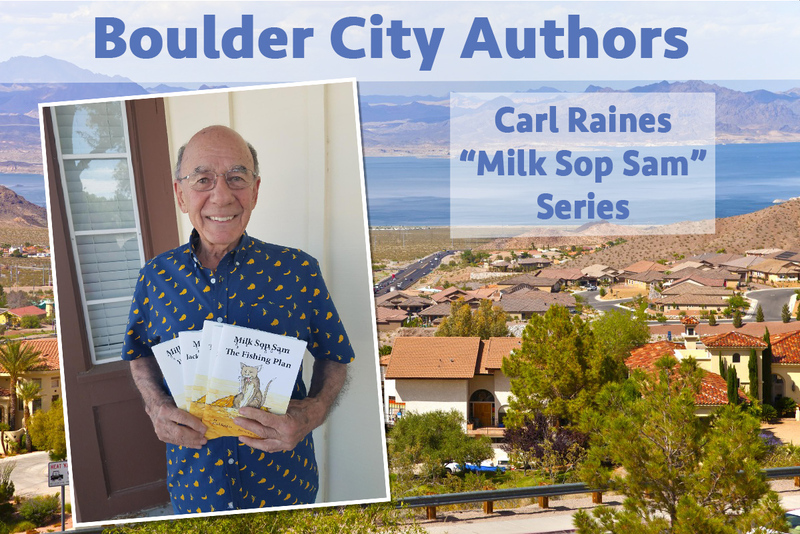 Please meet our first author, Carl Raines! Carl is a long time member of the Boulder City community. He started his restaurant business in the location that is now Evan’s Grill and had a busy and dedicated following from the first day he opened the doors. After five years of building his dream, the building across from the old Hotel, then called the Coca Cola Bottling Plant, became available. He promptly refurbished the building and moved his precious Mexican cafe to this new location. Ten happy years— filled with wonderful memories, amazing friendships, and more than memorable recipe creations— established Carl in his home. Today he can frequently be found at Milo’s, or taking his daily walks among the parks where enjoys acting as an ambassador to out-of-towners who ask him for directions. Recently acquiring two little abandoned kittens has revived Carl’s love of animals and helped him to revisit his amazing childhood with his first childhood pals. Of course! This is what has become a series of children’s books with a cast of characters at a farm, the lead of which is a cat, Milk Sop Sam. In Book 2, The Coyote Plan, there’s a coyote coming around the dairy farm at night trying to catch a chicken. Milk Sop Sam and the other farm animals come up with a plan to run the coyote off. The rest of the books continue on their adventures, and there are 5 books now, in total. I wrote the books for my only grandson. I hope others will enjoy these fanciful, colorful tales and, additionally, learn about farm life from a unique perspective. I published through my niece’s publishing company and the books are now available on Amazon. See them HERE. My stories illustrate life with my animal pals on the dairy farm where I was born and raised; a cat Milk Sop Sam; a dog Jack the Sniffer: a cow named Bess: and two giant workhorses, Dan and Bill. Sam would beg for milk, get sopping wet and groom himself dry. I loved them, the animals, and they loved me — and loved farm life together. Many of the characters are based on people I have known from Boulder City. One of the chickens, named Miss Amy, teaches all the baby chicks proper chicken etiquette and elegance! I’m a well educated man, but have no formal education in writing. My writing comes from the heart. In 1983 I moved to Boulder City, drawn by the vibrant desert flora and the clean, green promise. I have loved this sophisticated little town ever since! Just enjoy the stories! We’d also love if you followed us and shared your thoughts!